How do you know if your business is really ready to take on new employees? Start by estimating the potential revenue and profit gains, in light of the additional costs. Here are a few more signs that it may be time to hire. Customer demand for your company's goods or services is steadily increasing. It may take some time to confirm that growth is consistent and not a seasonal or temporary surge. You (and/or your staff) can no longer handle critical work in a timely manner, and customer service is suffering. You regularly pay current employees a significant amount of overtime. You would like to act on attractive growth opportunities, such as opening a new location. One or more people with a particular skill set are needed to help develop a new product or add to your menu of services. A new employee's salary can be substantial by itself, but Social Security, Medicare, and unemployment taxes add to the employer's total costs, as do legal requirements such as workers' compensation insurance. For example, U.S. employer costs averaged $35.28 per hour worked in June 2017, with $24.10 going to wages and $11.18 for benefits.2 Of course, an employer's actual costs will vary widely by industry, region, and the type of position. 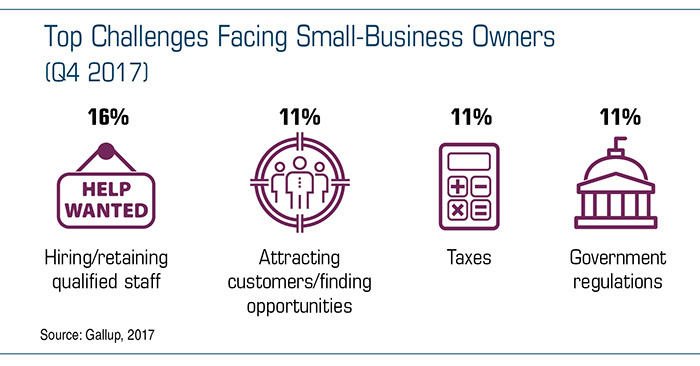 Small businesses may not offer workplace benefits (such as health insurance and retirement plans) commonly provided by large companies. Even so, offering a more generous benefit package might be helpful for recruiting and retaining qualified employees, a task that has become more difficult in competitive job markets. There may be additional expenses associated with screening applicants, training new workers, and complying with various federal and state regulations, some of which may be specific to your industry. In fact, you might consult an accountant to help determine whether you can afford to hire extra help. This information is intended for use only by residents of (MI). Please consult with each individual Financial Advisor listed on this site to understand what states they are licensed to transact business.